You may not create your own Pafoo for free! So...is this species completely done? This group's been quiet, is it still alive? How do I see how much the items I find during scavenging are worth? Also, should I be saving these for crafting? 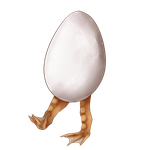 Egg has been wandering around, reply here to claim this Egg! I completed one of my Passages, the folder isn't open for everyone to submit to.